− three = 4 Required Please enter the correct value. The year-long rally in the U.S. dollar has slowed, but it's far from over. 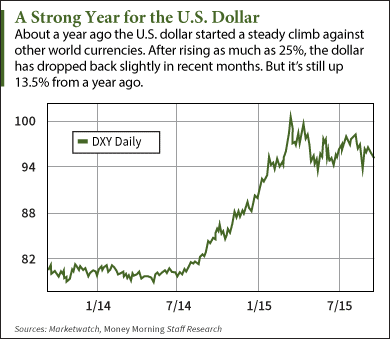 From July 2014 to March of this year, the U.S. Dollar Index (DXY) has soared by 25%. Since then, it has pulled back slightly. But the forces that drove the U.S dollar higher remain in place and will intensify in the months ahead. That means investors can expect a stronger U.S. dollar against most foreign currencies, including the euro, the Japanese yen, the Australian dollar, and the Mexican peso. It matters because the value of the U.S. dollar holds a pivotal spot in the world of investing. "The U.S. dollar is the oxygen of the global economy. 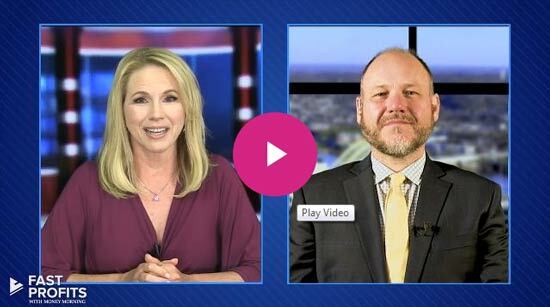 Everyone takes it for granted, but it determines the value of every financial instrument in the world – stocks, bonds, commodities, real estate, art, collectibles, you name it," said Money Morning Global Credit Strategist Michael Lewitt. Specifically, the strong U.S. dollar is the main reason that prices for commodities like oil, copper, and aluminum are down. Because commodities are priced in dollars, a more valuable dollar buys more of them for less money. The rising U.S. dollar has also hurt the earnings of U.S. corporations with significant overseas businesses. The strong U.S. dollar makes U.S. exports more expensive. Finally, the strong U.S. dollar has made life miserable for emerging markets. Governments and companies borrowed a lot of money denominated in dollars, Lewitt said. A stronger dollar makes those debts more expensive to repay. So how can we be so sure the U.S. dollar will keep rising? Simple, Lewitt said. While the U.S. Federal Reserve has spent the past year winding down its quantitative easing policy, other major central banks – particularly the European Central bank (ECB) and the Bank of Japan (BOJ) – have ramped up their monetary easing. Such QE policies weaken currencies. But the Fed is now going against this global tide. Regardless of whether it raises interest rates this week, it has signaled its intent to do so this year or early in 2016. "Even if the Fed doesn't move, the ECB and Bank of Japan are committed to further weakening their currencies. That means further dollar strength can be expected," said Lewitt.